Waterford Fine Bone China, Two Plates, in the Harcourt-Gold Pattern #WFCHAR, Circa 1997-2003. These Two (2) Plates being, 1-Salad, Accent or Luncheon Plate, and 1-Bread & Butter or Dessert Plate, are in the "Harcourt-Gold" Pattern #WFCHAR, by Waterford China. 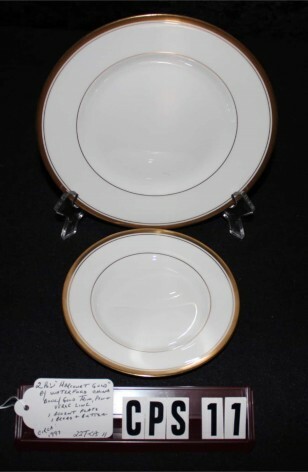 These Plates are White, with Wide and Narrow 22kt Gold Bands on the Rim edges. As well as 22kt gold Verges. The Plates are Exquisite on their own, but would look great with a Floral China Set as well.